Palo Alto, CA, April 02, 2015 — /EPR ELECTRONICS NEWS/ — Stanford student Jerming Gu, founder of CANDY HOUSE Inc., raised more than $800,000 dollars after his product launch on Kickstarter. Sesame – the world’s first instant smart lock – reached its funding goal in nine hours when first introduced. Currently, nearly 5,000 supporters have backed the project. Sesame allows users to lock and unlock their doors using the Sesame app on their smartphones. It is the only smart lock that syncs the movement of the lock with the phone, providing exact control of the angle to which the lock turns. Gu is a mechanical engineering master candidate from Stanford University. Originally from Taiwan, Gu is someone who usually thinks outside the box. Disruptor, troublemaker, entrepreneur, as he calls himself. “There has got to be smarter ways to live our life,” Gu said. Gu said he got the idea for smart lock due to his experience living in Asia where technology is relatively less developed. With five-patented design, Sesame works with just about any deadbolt in the world. Users can install it in seconds, without replacing existing lock or removing anything. Current model is optimized for US/Canada/northern Europe Markets. CANDY HOUSE also offers optional access point, which connects Sesame to the Internet when plugged into any nearby outlet. It lets users control Sesame wherever they are. With Internet connection capability, users can allow guests in remotely. They can also control who has access and when. To ensure safety, the Sesame app also sends out a notification whenever the door opens or closes. Founded and developed by Stanford University students, CANDY HOUSE, Inc. is a candy store that sells dreams, putting the joy and surprise of innovative technology in the hands of consumers, just like candy. It is also a design house, developing and manufacturing products that inspire a minimal lifestyle. It launched its first product – Sesame, the world’s first instant smart lock – in February 2015. For more information about CANDY HOUSE, Inc., visit the site online or follow it on Facebook or Twitter. 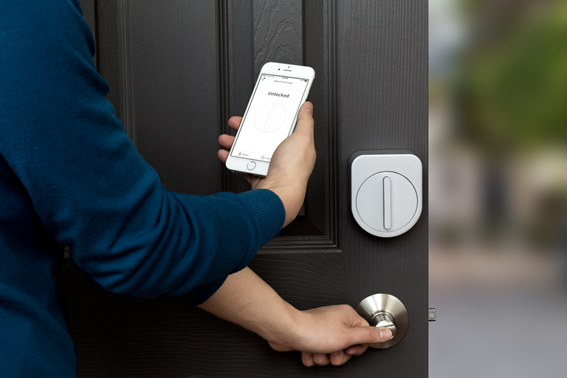 Palo Alto, CA, March 27, 2015 — /EPR ELECTRONICS NEWS/ — Sesame, the world’s first instant smart lock, raised more than seven times of its funding goal on Kickstarter. Launched on Kickstarter on Feb. 25, 2015, Sesame has raised more than $760,000 from backers all over the world.